Today I have a tutorial for a set of thank you notes that I made. My thank you note stash was dangerously low and I need a whole lot of them right now. I used Sketch #112 from Operation Write Home to create these pretty cards. This is the first time that I have used a sketch designed by someone else and I enjoyed seeing the results. Operation Write Home is an organization that sends cards to deployed soldiers to send back to their families. Isn't that a neat idea? You not only encourage a soldier, but you also encourage his/her family. We sometimes forget the sacrifice the families make so that their loved one can protect us. 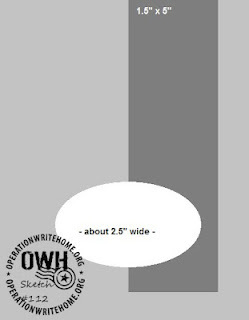 For more information on Operation Write Home, simply click on the sketch above to be linked back to their home page. Of course, I had to use K. Andrew Designs stamps to complete this project. I used "Owly Hoo" and "Scripture Sayings". Simply click on the stamps below to find out how to purchase these great stamps. DON'T FORGET TO ENTER THE CURRENT GIVEAWAY GOING ON MY BLOG. CLICK HERE to find out how. As always, I want to thank you for taking time to watch the tutorial. I hope it inspires you to try making your own thank you notes. Have a great day. These are so pretty!! I love the embossing on them!! i will have to check out the sketches! !